Trailhead is on Rt. 302 in Harts Location, NH, 8.8 miles south of Rt. 3 and just south of Saco Lake and the AMC Highland Center. Park at the pull-off on the west side of the road. Mts. 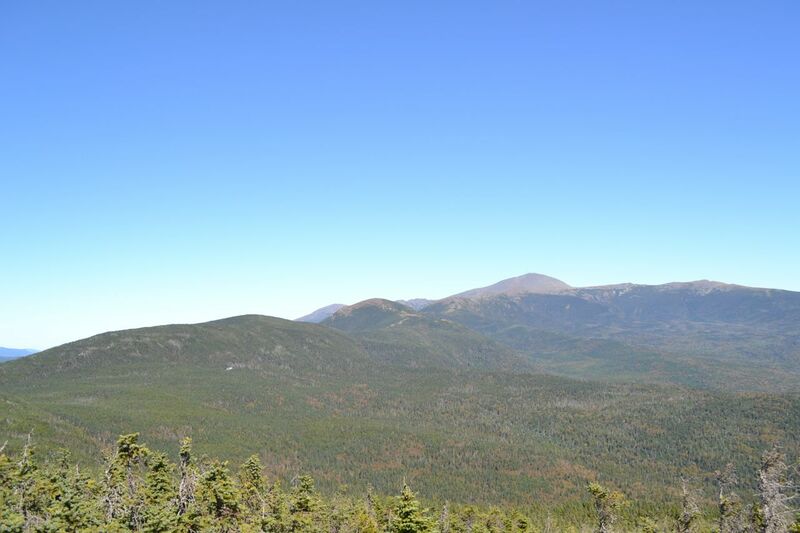 Webster and Jackson are the two southernmost peaks in the Presidential Range. Mt. Webster forms the eastern wall of Crawford Notch and is known for its dramatic Webster Cliffs. It has spectacular views across Crawford Notch to the Willey Range, south to the central White Mountains, and north up the Presidential Range. Mt. Jackson, a low 4000-footer, has even more stunning 360-degree views which include the Presidential Range-Dry River Wilderness. Both peaks are known for their population of lunch-snatching gray jays, adorable and amusing little birds which are nearly as exciting as the views from their home mountains. The hike is rough and rocky, but there are many features along the way, including a cascade. The hike starts under the large rock face of Elephant Head. Seen from the north, the rock assumes the shape of an elephant's head embedded in the hillside. Cross the road and walk to the trailhead, just past the brown sign for Mt. Washington State Park. The Webster-Jackson Trail climbs moderately over rocky terrain, high above Elephant Head Brook for 0.1 miles and passes the spur to Elephant Head. It continues along the brook for another 0.1 miles, then turns to the right and angles across the slope. The trail makes several short, steep climbs in this section, each separated by easy, level sections. In 0.4 miles from the brook, a spur on the right leads to Bugle Cliff, a fine viewpoint of the Willey Range from far below. You can also look over the "Gateway Region" of Crawford Notch. Bugle Cliff is similar to Elephant Head, but higher. An easier ascent across the slope with a few minor descents leads to Flume Cascade Brook in 0.3 miles, source of the lovely Flume Cascade, a popular scenic stop on Rt. 302. The gradual ascent continues for half a mile on the other side, until the trail splits into the Jackson and Webster Branches. We think the loop is most scenic when Webster is ascended first, so bear right here onto Webster Branch. It descends very steeply to Silver Cascade Brook at a small pool and cascade, then climbs an equally steep grade on the other side. The trail moderates at the top of the embankment, but continues to be significantly rougher for the rest of the climb. A mile of rough hiking in a mossy evergreen forest remains. The trail ends just below the summit at a trail junction. Turn right onto Webster Cliff Trail for the final pitch to the expansive summit of Mt. Webster. From the top of the cliffs is a fabulous view across the notch to the Willey Range. The wide talus slopes near the summit of Mt. Willey are spectacular from this perspective. To the southwest are Mts. Carrigain and Hancock, seen across the broad plateau leading from the Willey Range to the Nancy Range. To the north, you can see the Mt. Washington Resort, below the Cherry-Dartmouth Range. To the northeast, you can see Mt. Washington, Mt. Jefferson, and all of the Southern Presidentials, including Mt. Jackson. By walking down the trail just a little further, you will get a better view to the south, including the Moat Range, southern Montalban Ridge, and Mt. Chocorua. Here, on the summit of Mt. Webster, you will have your first chance of encountering grey jays. While the majority of their population resides on Mt. Jackson, many roam around this area as well. Be prepared with extra food to feed them, because they may attempt to take it from you regardless. An outstretched hand with a morsel is all these tame animals need to convince them you are a friend. To continue to Mt. Jackson, return to the trail junction and continue straight on Webster Cliff Trail. The trail descends from Webster with a few switchbacks, then passes a few boggy areas with views off into the distance. The trail is unusually rough across the ridge, as there are many short climbs and descents. It becomes even more difficult when it begins to climb Mt. Jackson; here, the trail scrambles up several very steep rocks. Just before the summit, the trail passes a great view into the Presidential Range-Dry River Wilderness; from here, you can now see much more of the Montalban Ridge. The summit is reached in 1.4 mile from Mt. Webster. From the summit, there are spectacular views in all directions, similar to the view from Mt. Webster. The view up the Presidential Range is much better from here. Below Mt. Pierce, you can see a white building: AMC's Mizpah Spring Hut. You can also see Boott Spur, which was not visible from Mt. Webster. From the northeast side of the summit, you can see Mt. Isolation, with the Baldfaces behind it. Many more grey jays will be found here, but you will probably also share the summit with a larger crowd of hikers. Descend from Mt. Jackson on Jackson Branch of Webster-Jackson Trail, which leaves the summit on the west side (to the left of the way you came up). The trail descends very sharply over the rock slabs of the summit and scrambles downward quickly through the forest. Once past the most difficult part, about a mile of descending through the forest is left before you reach the loop junction again, half a mile after the trail crosses three small brooks, each a branch of Silver Cascade Brook.